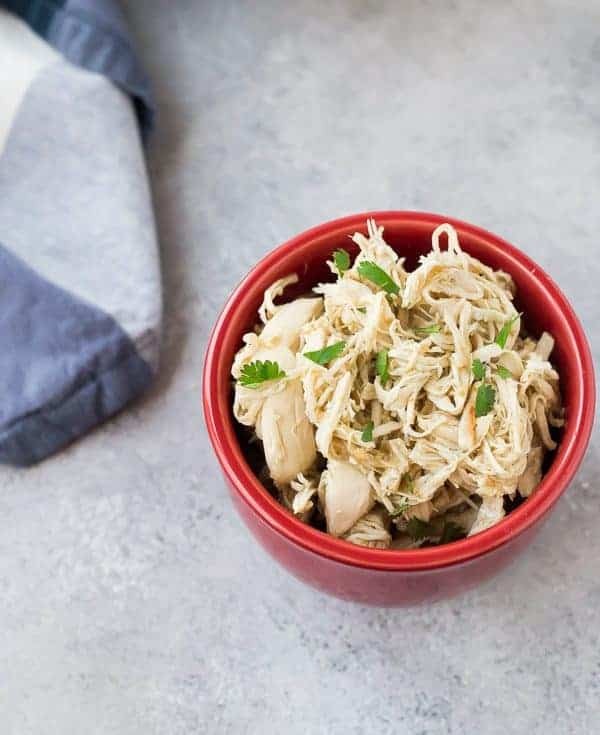 This Instant Pot Shredded Chicken is going to become a meal prepping essential! 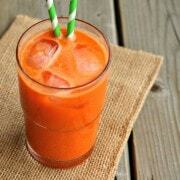 I cover four different variations, each made with only two ingredients! 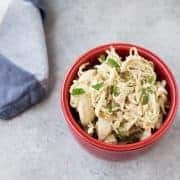 You’ll love this chicken on salads, tacos, burrito bowls, and in soup! Just like the lemon salmon, this is a recipe I make almost weekly. 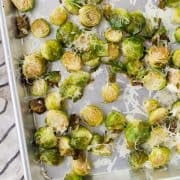 There isn’t much to it, it’s suuuuuuper simple and once you make it once, you probably won’t even need to refer to this recipe, but it’s helpful to have a guide the first time. However, once you master it, you’ll find yourself coming back to it again and again, especially if you’re someone that likes to meal prep. It’s a great thing to have ready and prepped in the fridge for busy days and evenings. Typically I make the salsa verde version because we like it the most and I find it to be the most versatile, but I’ll also cover a few other varieties that are just as delicious. It all starts with boneless skinless chicken breasts. Can you use thighs? Of course! Once you learn how to cook chicken in a pressure cooker, you are going to find yourself constantly coming back to this method. Shred, return to liquid, and eat! Or store in the fridge for up 5 days. I’d also recommend some pepper and possibly salt too, if you’re using a reduced-sodium broth. If you want to spice it up and add a little extra flavor, you could sprinkle in some homemade taco seasoning. One teaspoon will be mild, 1-2 tablespoons will give you a spicier shredded chicken. This is great on bbq chicken burrito bowls and also makes a great sandwich. It’s fun on top of baked potatoes with a sprinkle of sharp cheddar cheese. It also works fantastic for barbecue chicken pizza (<—hey guys, think it’s time I update those photos? YIKES…I’ve come a long way!). As a note on this one, if your favorite barbecue sauce is a really thick, sweet one, I’d recommend adding about 1/4 cup of water to prevent the sugars in the sauce from burning on the bottom of the pan. If you’re still worried about it burning, you could make the chicken plain and then stir in the bbq sauce after it’s shredded. How Long Do You Cook Chicken Breast in a Pressure Cooker? I find that 10 minutes (high pressure, quick release) is a pretty sweet spot for me. If they’re very small chicken breasts, it might take slightly less time (8-ish minutes), but if they’re big and/or partially frozen, you might want to give them closer to 12 minutes. I always check the temperature of the chicken breasts when they’re done cooking and if my thermometer doesn’t read 165°F, I turn the pressure cooker to saute, set the lid partially on (don’t lock it into place) and cook them for an additional 1-2 minutes until they come up to temperature. The most common way to shred chicken is to place it on a plate and use two forks to pull it apart. You can also place it in the bowl of your stand mixer and use the paddle attachment on low to shred. Don’t over-do it unless you like mushy chicken. My favorite way is not the safest way so alllll the disclaimers here – do this at your own risk, I assume NO responsibility for burns. 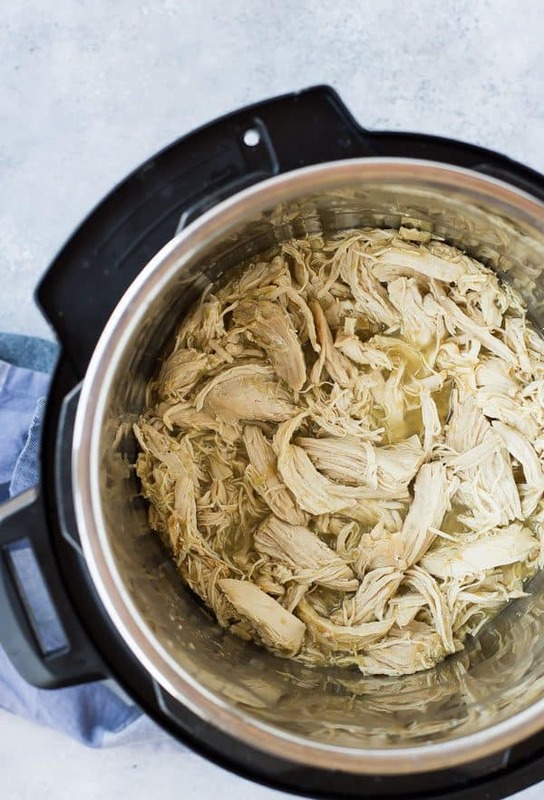 I use a hand mixer with the normal beaters attached to shred this Instant Pot shredded chicken and I turn it on low right inside the Instant Pot. It does tend to splatter a bit, so be careful. This method will shred your chicken in less than one minute…which makes it my favorite. Sometimes I put a towel over the whole operation to cut down on splatters. Instant Pot Sweet Potatoes – they’re perfect every time! Add both ingredients to the slow cooker. I like to put a little salsa (or other liquid) under the chicken as well as on top to prevent chicken from sticking to the bottom of the Instant Pot and to also make sure the chicken soaks up tons of flavor. Secure lid and turn valve to seal. Set Instant Pot to high pressure for 10 minutes. When cooking is complete, quick release pressure by turning valve to vent, watching out for steam. When pressure valve lowers, remove lid, check chicken with an instant read thermometer (should be 165°F) and shred chicken with forks. You can also do this faster but VERY carefully with a hand mixer, but be watchful for splattering liquids! I’m not responsible for burns resulting from taking this shortcut. 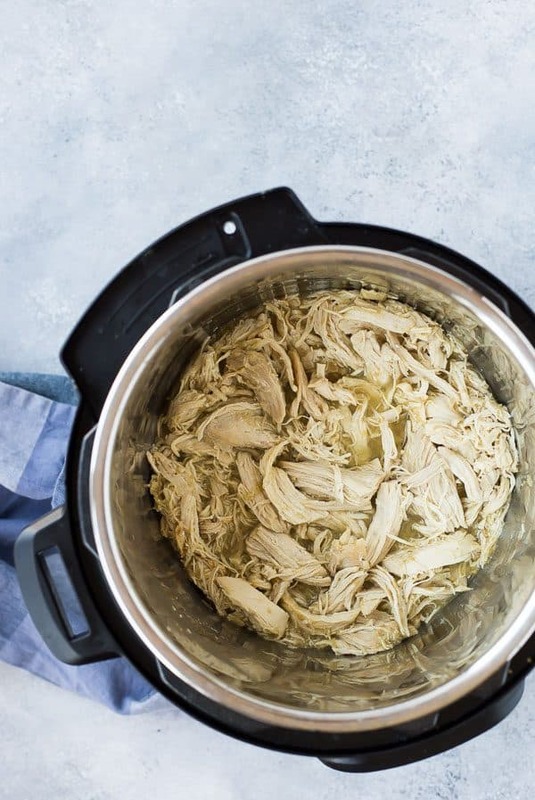 Once meat is shredded, return to liquid in Instant Pot and stir to combine before serving or storing in an airtight container for up to 5 days. Nutritional information calculated for chicken and chicken broth, please take into consideration the nutritional values of the particular sauce you choose. If the internal temperature of the chicken doesn’t reach 165°F by the time it is done cooking, you can switch your Instant Pot to Sauté and set the lid on so it’s slightly ajar. The chicken will finish cooking quickly on the sauté mode. If you re-pressurize the Instant Pot, it’s likely to overcook the chicken. 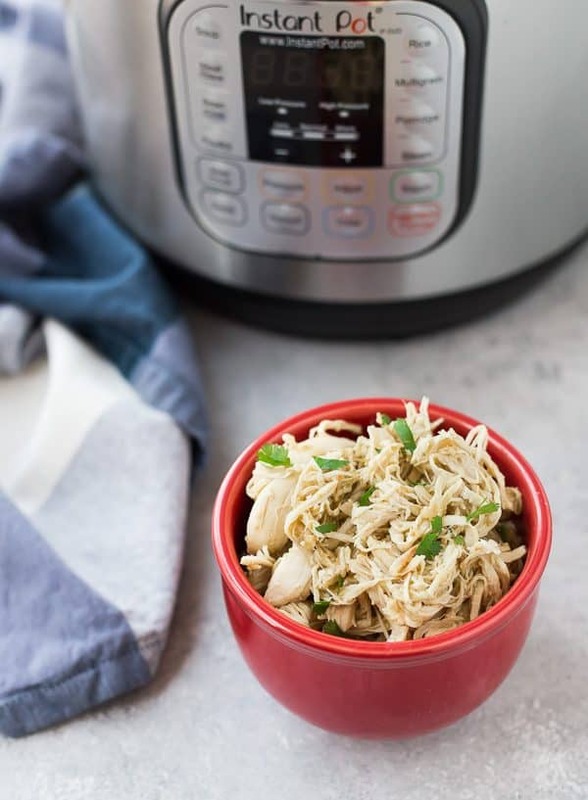 Verdict: I make this Instant Pot shredded chicken once a week, that says it all, doesn’t it? Husband’s take: Ben loves taking this chicken to work in his lunch or eating it on nachos at home. Changes I would make: None are necessary, I give you four great ideas here! However, feel free to experiment with it, it’s a very forgiving recipe. My very frozen chicken breast weren’t quite done (my fault as I left the meta stand in my pot instead of putting right on the bottom of the pot). However, I used your tip of sautéing for a few minutes after I released the pressure and they turned out perfect! I shredded and put on top of your instant pot baked potatoes! I’m glad that tip helped! Thanks for the comment! I bet they were so good on top of baked potatoes! This is a method to cook chicken…there really isn’t a whole lot more to it so I’m not sure you’d want to use alrady cooked chicken. If for example, you want the salsa variety, you could just spoon some salsa into your cooked chicken. I tried two variations of this recipe – BBQ and chicken broth. Both ways turned out excellent! I prefer the chicken broth recipe for a number of reasons though. 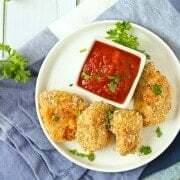 The chicken seemed easier to shred, and, since its made without any sauce, it can be a base for any number of different dishes later making it very versatile. I’ll be using this recipe any time I need to shred chicken in the future. Thank you! Hi Kristen! I love the versatility of this recipe, too. I’m so glad you liked it! Thanks for taking the time to come back and leave a comment! This was a major fail in my instant pot. Three separate times I got the burn signal and I followed the recipe exactly. I even added extra salsa and extra water and tried it again and nothing. Such a waste of food. I’ve made this probably 50 times and have never experienced that. I also know of many other people that have been successful with this. Are you having this problem with your Instant Pot with other recipes? Do you add time if the chicken is still mostly frozen? Just saw your note above about partially frozen adding a couple minutes ;) thanks! You’re welcome! Hope it turns out great! Thanks for this! Can you also do a natural release? You definitely should! I love mine! Such a great meal prep recipe! Thanks for the shout-out for my Ham and Cabbage Soup too.